ages to create finished images in relatively few steps. printing by hand, and experimentation with textures and collage materials. personal artistic intent and expression of ideas and images. About the instructor: Katherine Venturelli, is an artist and instructor nationally recognized for unique artist books and fine prints produced from her printmaking studio in Amador County. Her work is represented in many prestigious collections including the SF Palace Legion of Honor: the Getty Museum; and the Crocker Art Museum. 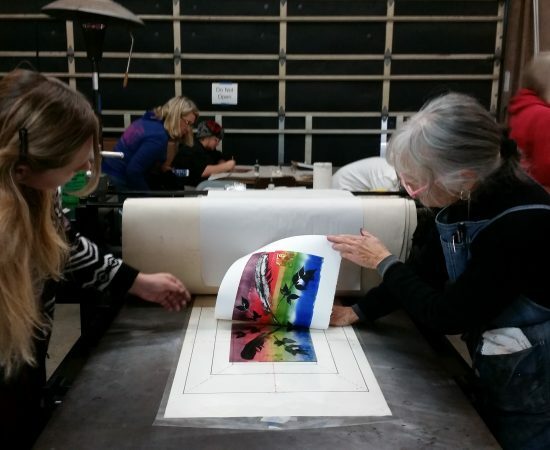 Over 40 years as an arts educator, Katherine has been able to share her passion for the monotype printmaking process.